Apple has had a busy week. Earlier this week she treed a raccoon and last night she treed a possum in our backyard. We are convinced that mother nature is trying to hasten our departure from the neighborhood. 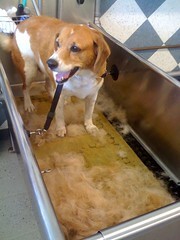 We had Rufus in for his summer undercoat removal. THAT is a lot of dog hair! The Dirty Dog is donating all of the hair to the gulf oil spill cleanup efforts and I think Rufus may have singlehandedly saved a pelican or two. Our pitbull Apple LOVES balloons... maybe a little too much. She will chase them and bark at them until they stop floating. After popping the balloon she will paw at it in the vain hope that it will re-inflate and start floating again. A package of tortillas disappeared from the kitchen counter while Happy and Leo were house sitting a few weeks ago. Yesterday I came home to find Rufus in his bed working over a moldy, dirt-encrusted, leafy package of tortillas that I can only assume are very same ones that went missing. 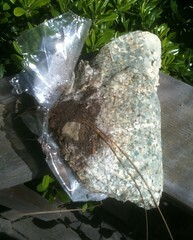 This might also go a long way towards explaining the moldy hamburger buns I found in the ceramic flower pot last month.